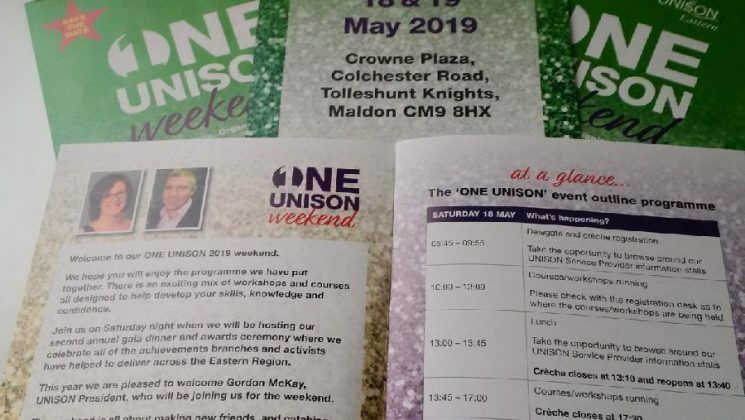 Preparations are well under way for our second annual Eastern Region ONE UNISON Weekend event. The weekend will consist of a choice between workshops open to all UNISON activists, training for newly elected branch officers or the new presentation and media skills course for more experienced activists and branch officers. The programme is hot off the press, with hard copies going out to branches now, but you can read a digital version here. On Saturday evening there’ll be a return for our popular Gala Dinner and Awards Evening to celebrate our branches and activists, with UNISON president Gordan McKay – and dancing into the night with our popular DJ Karl Buzby. To celebrate 2019 as Year of the Young Worker, we’re introducing a special award for a young worker who has made an outstanding contribution to UNISON. Nominations for that award, as well as more information on all the other awards, can be found in the programme. Nominations must be received by 5pm on 6 April. Anyone wishing to go will need to complete this special ONE UNISON application form rather than our generic events application form. This is sure to be a popular event so branches should ensure their delegates’ application forms are completed and sent to us as soon as possible – definitely no later than Monday 15 April. If you’re on Facebook you can show your interest and keep up to date with the event here.